Our tagged gray seal—Bronx—has been busy in the inshore and offshore waters around Cape Cod these past six months as he continues to carry our GPS tag that pings back location, dive, behavior, and oceanographic data. Over the 155 days (just over 5 months and counting) of successful relocation and data transmission, the mobile-enabled GPS tag, Bronx has covered nearly 40,000 km2, an area roughly the size of Massachussetts and Connecticut combined. Clearly, Bronx is a traveler unafraid of straying beyond the local neighborhood and environment. In the past 5 months, the modern tagging technology we deployed in collaboration with others has confirmed some behaviors and activities we expected of seals in this area when we began the tagging project. However, the data has also revealed new discoveries about seal ecology, emphasizing the unique nature and adaptation of these seals as they recolonize their historical habitats in the US Northwest Atlantic. These findings are summarized here in the Map that shows different-scaled home ranges (i.e., where the animal can be found 25% of the time, 50% of the time, and so on) and discussed further in the post. Let’s explore these one by one. Bronx is no stranger to any of the beaches or nearshore waters off the Route 6 roadside that transects Cape Cod, leaving few stretches of the coast unexplored. Even at a minimal home range where Bronx is found 25% of the time, Bronx exhibits a cape-wide distribution. Still every commuter has their favorite stretches of the road and Bronx is no different. He appears to split time between resting beaches (termed “haulouts”) at the north and south ends of Cape Cod. In the south, the animal appears to use Monomoy Island as home base, returning repeatedly and spending long resting periods here. Expectedly, Monomoy Island is a popular haulout and always seems brimming with abundant seals on the beach. 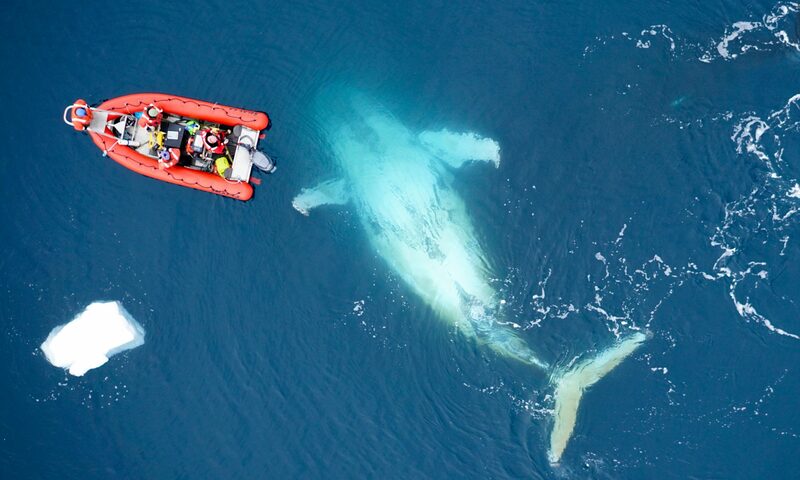 In the north, activity centers around beaches near to North Truro, where the animal can travel up into Stellwagen Banks NMS and into Cape Cod bay easily. 2. International Traveler: Bronx visits Canada for “business” or “pleasure”? Another exciting finding in the tag data from Bronx was two long-extended forays (see tracks highlighted on the map), including one across the Exclusive Economic Zone (EEZ) international boundary that divides Canadian waters from the U.S. waters. During this international journey, Bronx appears to navigate to Georges Bank and spend 12 days at the storied and historic fishing grounds. Spending nearly 2 weeks at sea, Bronx travelled 1300 km in total before returning to the southern end of Cape Cod. Our upcoming dive analysis will begin to evaluate Bronx’s activities on Georges Banks. Since New Year’s however, Bronx has spent nearly all of his time journeying back and forth across the Great South Channel southeast of Cape Cod and Nantucket Island. In back-to-back-to-back- to-back- to-back trips (yep, that’s 5 return trips! ), Bronx has explored these offshore habitats for over a month now. On each following trip, Bronx appears to travel farther across the channel and farther from the Cape. As of 13 February 2013, Bronx reported in from the northern tip of Nantucket near Coskata-Coatue Wildlife Refuge. Whether this is just another break from the offshore forays or a more permanent “stay-cation” in the nearshore waters of Cape Cod will have to wait for another blog post when the next chunk of data transmits. In addition an exciting journey to Canadian waters and week-long visit at Georges Bank, Bronx has shown off its diving prowess in the past 5 months. Just before arriving at Georges Bank, Bronx dove to an impressive 265 meters deep on a dive that lasted 8 minutes (you try holding your breath for 8 minutes!). The research team is now trying to evaluate this extraordinarily deep dive and confirm it as one of the deepest (if not the deepest) dive observed yet in a wild gray seal. For comparison, Bronx’s average dive is around 40 meters deep lasting less than 3 minutes. Still, dives beyond 200 meters deep are not infrequent for Bronx, who has recorded 33 dives to these deeper habitats and even more between 100 and 200 meters. Seals dive for many reasons, including to travel, eat, or explore. The research team is now building models to analyze each of these dives in association with the movement and habitat to understand if the dive is an effort to find and feed on prey. 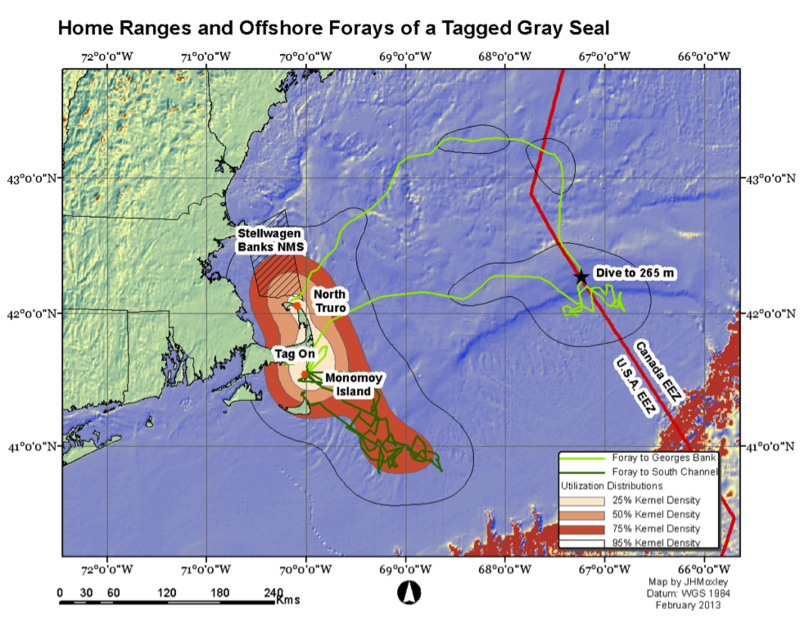 The tag Bronx carries on his back is expanding society’s knowledge about important habits, habitats, and adaptations of gray seals in Cape Cod. A robust gray seal population has not persisted here in the Gulf of Maine for decades and these animals are challenged to adapt their life history to the new marine environment. The research team eagerly awaits each new transmission from the tag to analyze it and compare it to what the research world already knows of gray seals. We can’t wait to report back when Bronx pings back the next bit of data. Previous PostPrevious Spinner article in Natural History magazine! Next PostNext “Holy Humpback” of a Day!